There's a lot of politicking in the Pentagon, Congress and even in the Department of Defense's civilians. You cannot assume it is purely a technical problem. During the Clinton administration, lasers were largely verboten. They were a legacy of SDI and, therefore, bad. During the Bush administration, Rumsfeld was not a fan and wanted his FCS + fought two wars. During the Obama administration, they were neglected at first and then started getting more funding towards the end, but even so there were how many wars? Laser development has to compete with other priorities in the Pentagon. After all, this is the Pentagon that thought the Littoral Combat Ship was a good idea. LOL could be, my blood pressure goes up even when I see the acronym "LCS"
Yet another laser platform from Zhuhai, this time designed to eliminate explosive ordnance & munitions. mr.bean, Dfangsaur, PanAsian and 4 others like this. I wonder how deep can the laser penetrate underground explosives and ordinances? This would be good to eliminate those millions of mines left undetected through out the world in war torn zones. I don't think it could penetrate underground. It needs to illuminate the physical crust of the mine/ordinance in order to trigger an explosion. Here is another interesting laser showcased on Zhuhai. It is an anti-drone laser small enough to fit on a DongFeng Mengshi! It seems to have a similar power output as the GuorongI laser but is much smaller and more compact. China seems to be on the verge of "cabbagizing" point-defense lasers the same way it did DSI intakes and AESA radars! PanAsian, N00813 and Equation like this. The newest members of China's military arsenal are a host of laser weapons, as the country makes a serious commitment to cutting-edge hardware. China Aerospace Science and Industry Corp, the nation's largest missile maker, has developed a road-mobile laser defense system called the LW-30, which the company is promoting to international markets. The LW-30 uses a high-energy laser beam to destroy targets ranging from drones and guided bombs to mortar shells. It features high efficiency, rapid response, a good hit rate and flexibility, according to CASIC. An LW-30 combat unit is composed of one radar-equipped vehicle for communications and control on the battlefield, at least one laser gun-carrying vehicle and one logistical support vehicle. The laser gun can be deployed with close-in weapons systems and air-defense missiles to form a defensive network free of blind spots, the company said. It said that in a typical scenario, the LW-30's radar will scan, detect and track an incoming target before transmitting the information to the laser gun. The gun will analyze the most vulnerable part of the target and then direct a laser beam onto it. Destruction takes place in a matter of seconds. Fast-moving targets such as guided bombs and mortar shells are difficult to intercept with most types of existing weapons because they are too fast to be caught and usually come in large quantities, said Wu Peixin, an observer of advanced weaponry in Beijing, adding that while advanced air-defense missiles are capable of hitting such targets, it is unreasonable to use an expensive missile to bring down a bomb or shell. "Therefore, a laser gun is the most suitable weapon to defend against these threats," he said. "Every military power in the world has been striving to develop laser weapons. They have bright prospects in the international arms market." In addition to CASIC, other State-owned defense conglomerates are ready to take their laser weapon systems to market. 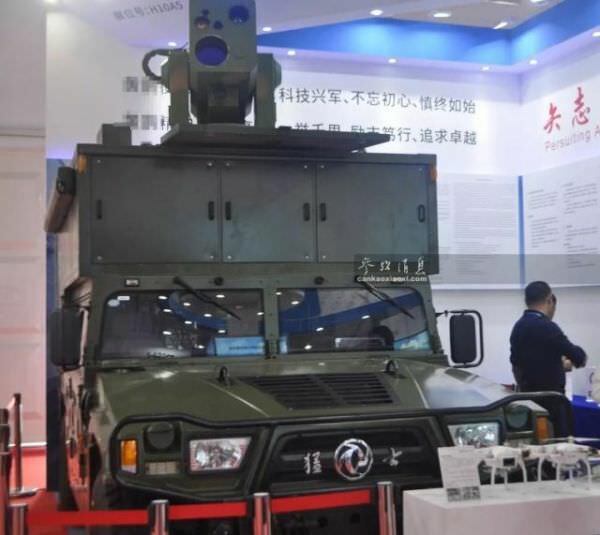 China Shipbuilding Industry Corp, the world's largest shipbuilder, has made another vehicle-mounted laser weapon that integrates detection and control devices and the laser gun in one six-wheeled vehicle. Observers said the system should be fielded to deal with low-flying targets such as small unmanned aircraft. China South Industries Group, a major manufacturer of ground weapons for the military, is trying to attract buyers for its mine-clearing laser gun, which is carried by a light-duty armored vehicle. Designers said the system is able to dispose of land mines from a distance, avoiding hazards to personnel. Equation, Dfangsaur and N00813 like this. Video of Silent Hunter Laser on display at IDEX 2019. The display board shows the laser penetrating 5 layers of 2mm steel at a distance of 2KM under 8 seconds and destroying a 6-rotor DJI drone at a distance of 4 km under 7 seconds. The link above claims that the Silent Hunter system has already seen service in the PLA for five years and can target drones resistant to electronic interference. Equation, Dfangsaur, mr.bean and 2 others like this.